The MAKS-2017 static display features an Ilyushin Il-76LL flying testbed with a Klimov TV7-117ST turboprop engine installed under its wing. A representative of the United Engine Corporation (UEC) told Show Observer that the powerplant is being prepared for the beginning of the flight testing program. The TV7-117ST is the newest iteration of the TV7-117 gas-turbine engine family. 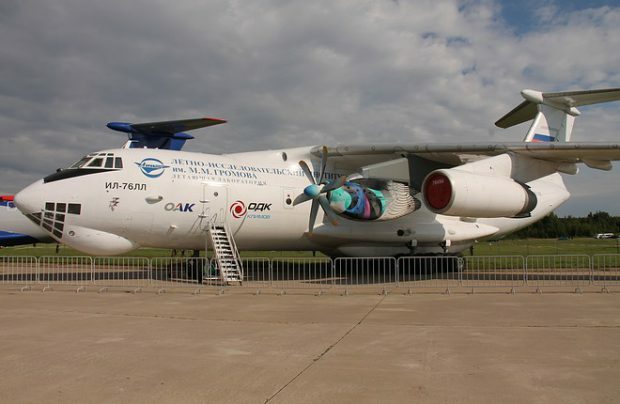 It was initially designed for the Ilyushin Il-112B light military transporter. Later on, the Russian Ministry of Industry and Trade jointly with the UEC and the United Aircraft Corporation decided to modify the engine to power the Il-114-300 regional airliner, which is currently equipped with less powerful TV7-117SM powerplants. Ground tests on the new turboprop engine began in September 2016. A new test bench was designed and manufactured for it to allow for running tests on the powerplant in combination with the propeller, nacelle, and a representative section of the Il-114V wing and fuselage. Speaking at the ceremony to unveil the facility, UEC General Director Alexander Artyukhov noted that 16 prototype engines would take part in the testing program. Ground and flight tests are scheduled to be completed in 2019. The TV7-117ST is designed to be more efficient than the existing competition: its FADEC system controls not just the engine but also the Aerosila AV-112 propeller.